The ultimate hi-fi stand? The design is an improved version of the original Seismik Sink stand which re-wrote the rules on vibration isolation and is quite possibly the best isolating stand in the world. 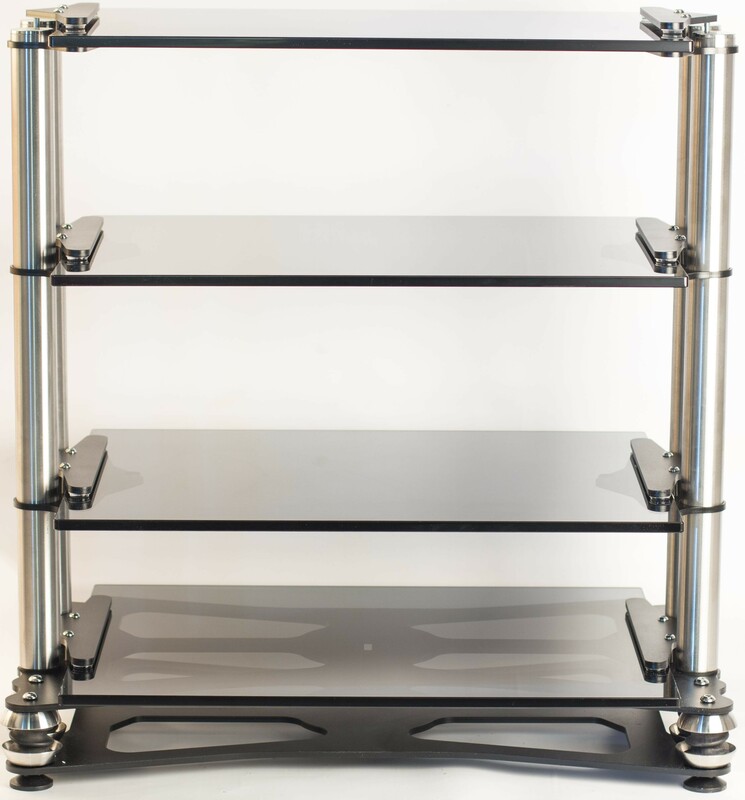 This stand is built to suit your system. Prices start from £1200. Please contact us for a quote. What's so special about this stand? Stand design has traditionally insisted on rigid coupling to the floor to “drain away unwanted energy”. The superior performance of the spring suspended Seismic Sink Stand, compared with all rigid designs, showed the hi-fi world how absolutely vital it is to thoroughly isolate all source components from ground-borne vibration. The Seismic Sink Stand, with its beautiful lines and elegant simplicity, sets a new level of performance, style and practicality. Of minimalist design with the shelf supporting pillars closely spaced at the sides and the suspension mechanism at the bottom. The Seismic Sink Stand allows the equipment to be seen un-obstructed by big bulky pillars common to other designs. Designed to be 100% maintenance-free and manufactured to the highest standards, the Seismic Sink Stand is engineered to last a lifetime. The ingenious arrangement of uprights and plates, with most compliant load cells at each corner, in conjunction with the mass of the stand (plus equipment), form a stable suspended mass/spring low-pass filter with an attenuation of about 20dB per decade above 2Hz. This ensures that deleterious ground-borne vibrations from 4Hz and above are virtually eliminated. Isolating audio/video components from vibration increases fidelity and imparts an openness and clarity to the sound, with gains in focus and solidity of image, which a non-suspended stand simply cannot approach. 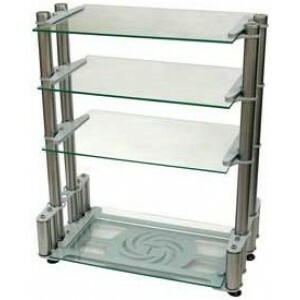 Standard shelves are of polished and toughened safety glass, for appearance and durability. And, contrary to popular belief, the glass does not “ring” as it does on spiked stands because the four point mounting clamps have vibration absorbing pads which form a constrained layer damped assembly with virtually no resonance and once the equipment is in place. Further the rubber feet on the equipment completely eliminate any possibility of ringing. The stand rests on soft plastic feet, which will not harm wood or carpet floors and are easily adjustable for levelling. 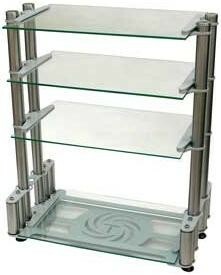 - Shelf Spacing: shelves are infinitely adjustable, shelves may be added/removed without dismantling. - Height: Can be built anywhere from 22cm (9”) to 120cm (4’) high. - Number of shelves: Upto 8 in total. - Glass thickness: 6mm or 10mm (for heavier equipment). - Glass Colour: Clear, bronze or smoked grey glass. - Metalwork Finish: Light grey with stainless steel pipes or black with stainless steel pipes.